Honestly, I have made this mistake before! I went area rug shopping and clearly chose one too small because I was intimidated by the size of the 8×10 on the rail, so back to the store I went to exchange it for the big intimidating size, which once on the floor and the furniture comfortably sitting on the rug looked PERFECT! The first rule, is measure the rectangular space around the furniture you have in your living space. 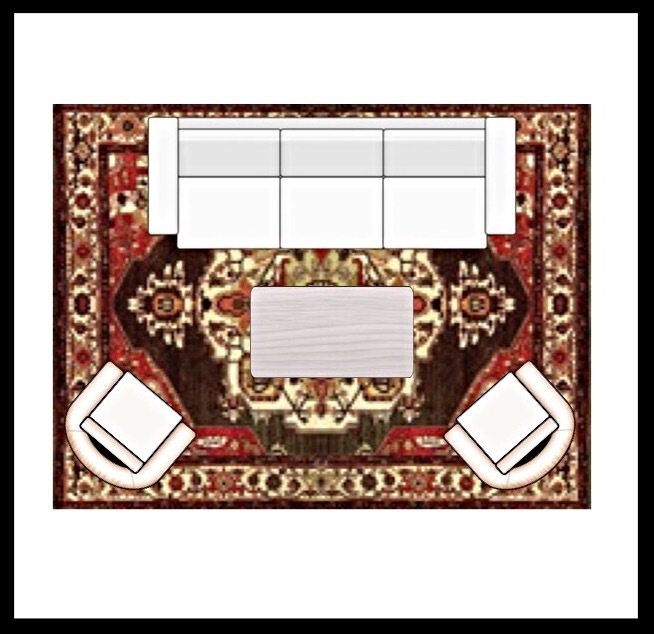 Arrange the furniture how you would like them placed, and with a masking tape, make a mock rectangular outline around the furniture that will resemble your area rug. Measure the outline and make the note of the size you should be looking for. This ideally, should be the size of area rug you will be looking for. Even if you live in a small condo, don’t buy a 4×6 rug. Just because your space is small, a small rug will make it seem even smaller! Follow the masking tape trick I have suggested above and look for an area rug that size. A) This is a big No No! Here you see how lonely the furniture pieces are as the area rug is not proportioned to the furnishings. This type of rug (4×6) would be better suited by the side of the bed! B) The second example is better! This would be a more condo size rug, or smaller room in a home. Proportioned to the space and the furniture legs will be sitting atop the area rug making the connection. You can already see there is a conversation between the furniture and he rug in harmony. The legs are 50/50 on the rug, a nice flirting between the pieces and you can see how this bigger rug (about a 5×7 or 8) gives the room more visual harmony and stability. C) For those of us who have large open concept living spaces or large family or sitting rooms, a large rug (8×10 or larger) is your optimal choice. You see here how this is the perfect arrangement as the rug acts as an island for the furniture it’s placed upon! This is the best option for many living spaces and gives the room a well proportioned and harmonious vibe. 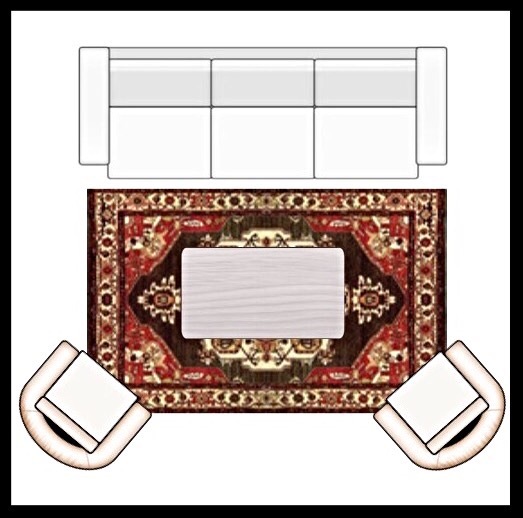 So, ideally, you want to buy an area rug that is either B or C. Remember the area rug as an island and the legs of your furniture should be either on it entirely, or at least touching the rug with their legs. 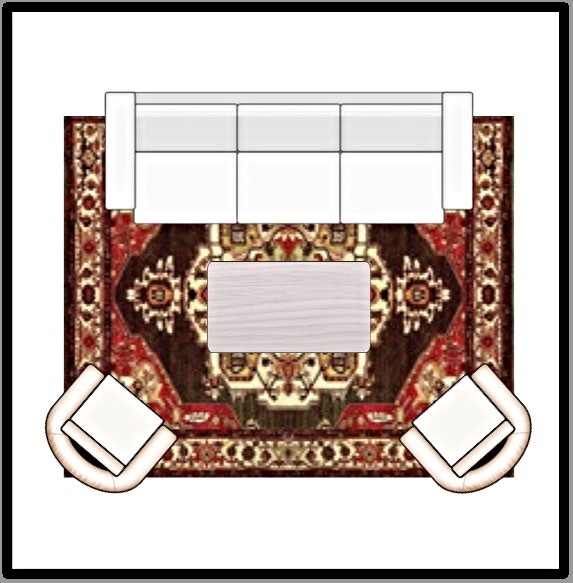 I hope that this post on area rug sizes in your living spaces have given you insight to proper “decorator approved” tip on choosing the right area rug. ← Decorating with Colour and Pattern.